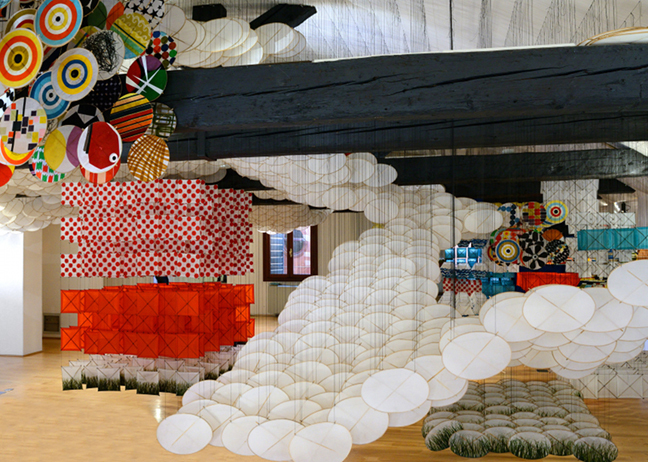 Jacob Hashimoto: GAS GIANT has been opened to the public on 29 May 2013. 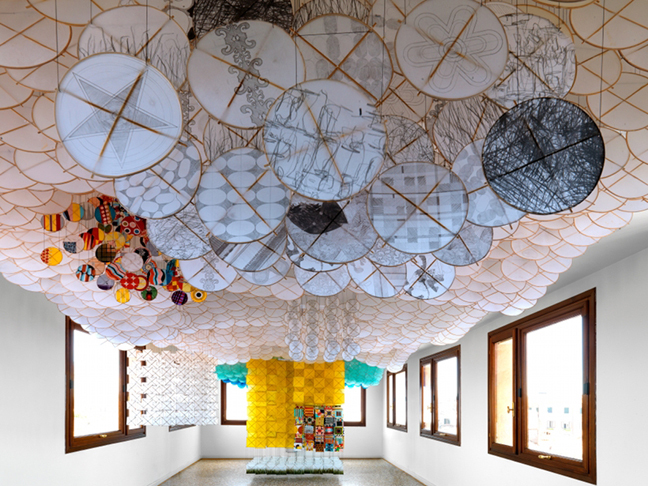 Organised by Studio la Città, Verona, it has been installed on the fourth floor of the Fondazione Querini Stampalia, Venice, in an area recently restructured by Mario Botta. GAS GIANT is a large-scale site-specific installation that the artist has conceived to interact with the rooms of the Fondazione Querini Stampalia in Venice; its aim is to create an unmediated relationship with the viewer. 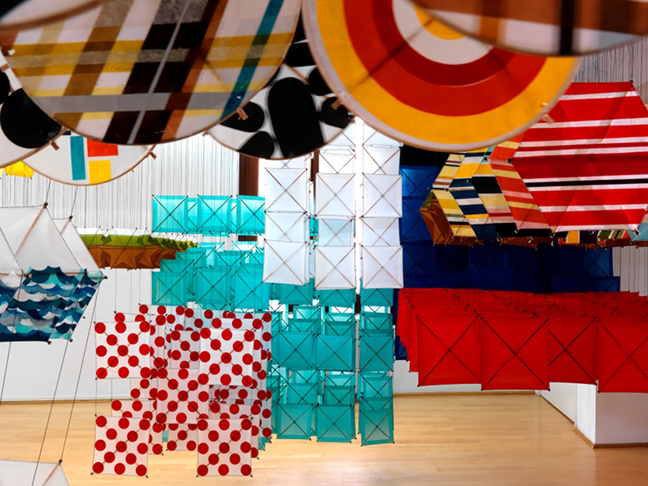 The work of Jacob Hashimoto (1973, Greeley, Colorado, U.S.A.) is characterised by the use of certain stylistic elements borrowed from Japanese culture, such as kites made from bamboo and paper; Jacob reassembles these to build huge installations and interactive sculptural forms that literally invade the exhibition area. The visual complexity of his work, together with the lightness of his materials, accompany the visitors along their sensorial itinerary, one in which space-time coordinates are lost and where the visitors are enveloped in a feeling of wonder and amazement. Hashimoto’s installations are, at one and the same time, a tangible exploration of the fascinating possible intersections between painting and sculpture, figuration and abstraction, nature and artifice. 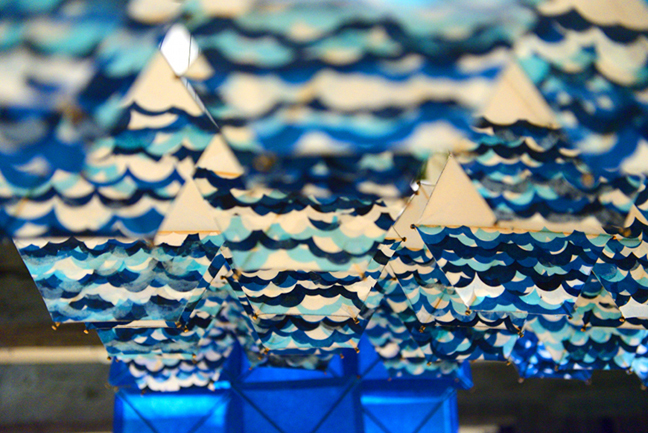 The artist has said, “There is a playful component in my work. The stylistic elements that I use have something to do with a general feeling of nostalgia rather than any direct relationship to my origins. 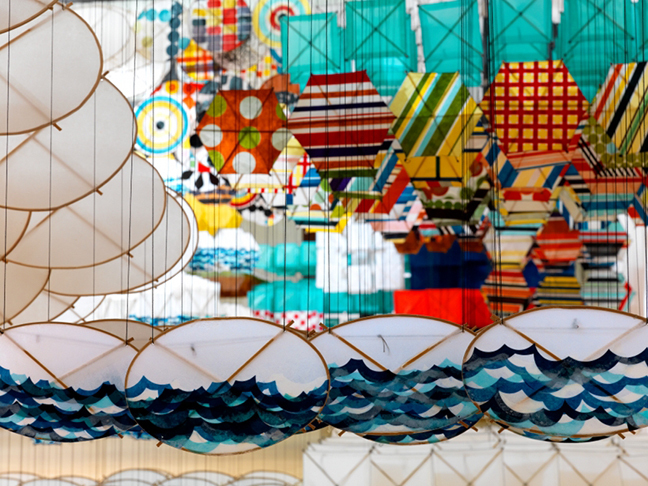 Kites are about a feeling for childhood and a relationship to nature rather than a particular Japanese tradition”. 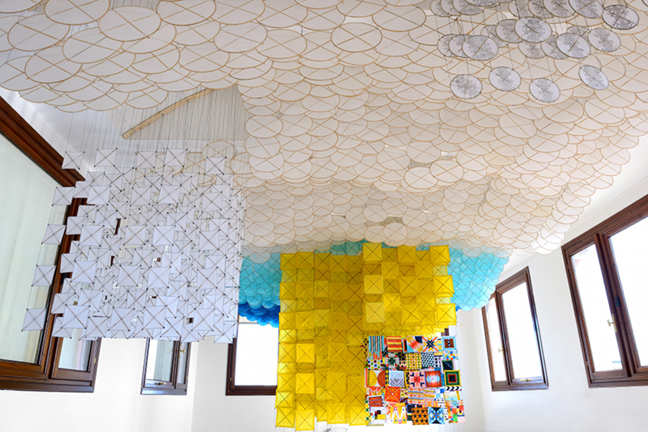 After a long series of installations in museums and international exhibition spaces (among them the work Superabundant Atmosphere installed in Palazzo Fortuny, Venice, on the occasion of the show In-finitum, 2009), Jacob Hashimoto has, concurrently with the 55th Venice Art Biennale, now filled the Fondazione Querini Stampalia’s Venetian building with a new installation. GAS GIANT consists of 10,000 bamboo and paper kites handmade by the artist; these will be the visitors’ companion from the central room to the top floor. Here the work condenses and is transformed into a thick cloud that invades and saturates the space. As the show’s title suggests, the giant size of the work, typical of Hashimoto’s art, dialogues with the extraordinary lightness and delicacy of the materials utilized and sparks off the first-hand participation of the visitors: they are immersed in the stillness, as well as the grandeur, of a setting that simulates an uncontaminated world that, however, does not exist. 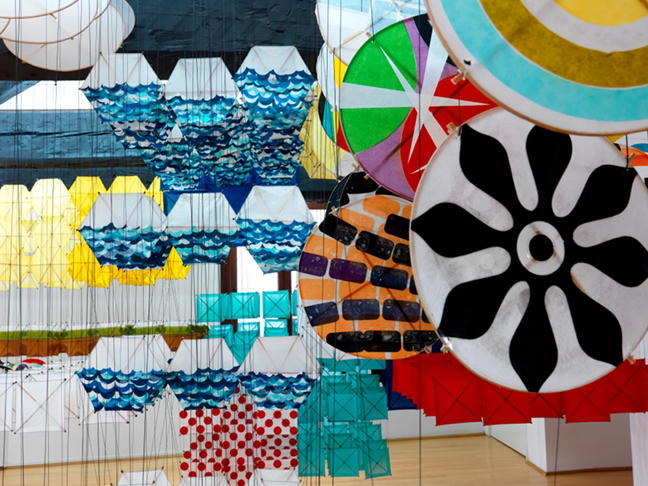 White, the predominant colour of the 10,000 kites that make up GAS GIANT, is interrupted by coloured patterns and geometrical and plantlike motifs; these confer on the installation a movement that is both temporal and rhythmic. In his work, in fact, Hashimoto elaborates an increasingly new definition of space and time, and explores the dreamlike aspect of a nature that changes perspective and meaning through its relation to an observation point, causing the viewer to instinctively undergo a meditative experience of the work. Not just the tension, but also the visual exuberance of Hashimoto’s work and its search for a precise luminous dimension – both literally and metaphorically – give it a poetic aspect, one that often cannot be defined precisely or stylistically pinpointed in the artist’s output. His works, in fact, are both architecture, given their precise three-dimensional structure, and painting, given the redefined chromatic effects of the surface of the paper.